Buckingham Palace has been the home of the British Royal Family since 1837. The Palace is one of the UK’s most iconic buildings, most visited tourist attractions and has one of the most famous balconies in the world. Before the palace, the area of land on which it is situated was a plantation of mulberries used to rear silkworms for James Ist. In 1628 Charles 1st gave the land to Lord Aston and records show that a large house already existed that had various owners. Eventually, this house and property were bought by John Sheffield (later the Duke of Buckingham) who was displeased by the old-fashioned style of the original house and decided to demolish it and build ‘Buckingham House’ in 1703. The house stayed with the Duke until 1761 when King George III bought it for his wife, Queen Charlotte. It became known as the ‘Queen’s House’ and although the royal family resided there, the official residence continued to be St James’ Palace. Thus, Buckingham House remained a ‘House’ until the reign of King George IV. Having grown up in Buckingham House he wanted to transform it into a palace and gave the task to the Official Architect to the Office of Woods and Forests, John Nash. Nash turned the house into a palace by rebuilding the two east wings, extending the central block and adding a triumphal arch in the centre. Nash’s transformation was magnificent, but it had come at a cost of £496,169; significantly over budget. When King George IV died the new king, his brother, William IV decided to remain at Clarice House instead of moving into the palace. In 1834 when a fire destroyed the Houses of Parliament he offered the palace as a replacement; fortunately for future royals, this offer was kindly declined. 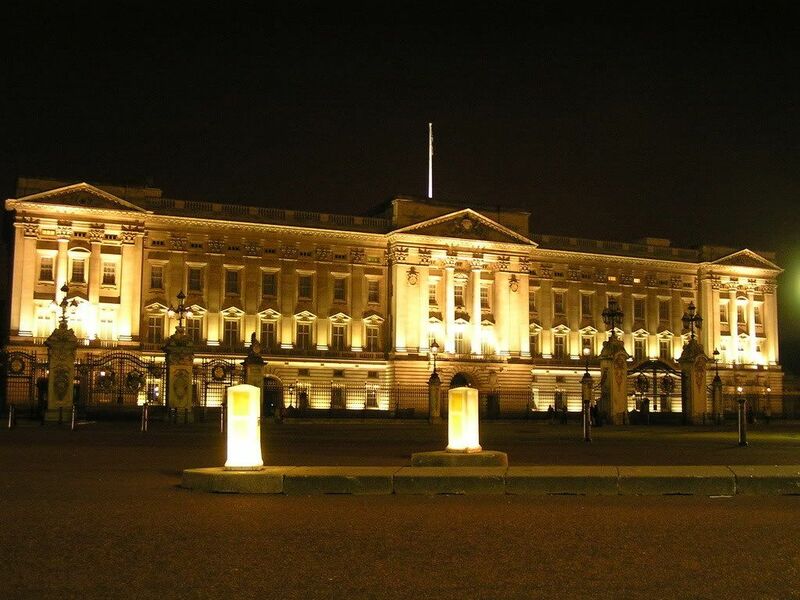 Buckingham Palace did not remain empty for long and its function as a family home flourished under Queen Victoria. Insisting that the Palace was too small for entertaining, Queen Victoria oversaw the building of a new front wing that included a central balcony. Under the architect, James Pennethorne in 1855 the physical aspects of the Palace were completed and the triumphal arch, also known as Marble Arch was moved to Hyde Park. Subsequent monarchs have focussed more on refurbishments and interior decorations than adding to the building. The main exception to this was in 1962 when The Queen’s Gallery was build from the ruins of the former Private Chapel that had been destroyed in World War Two. During the Second World War, the royal family stayed in the palace. Queen Elizabeth (the late Queen Mother) ignored Foreign Office advice to leave Britain and was adamant that the family would stay together in London. The palace was a key target for Nazi bombs and was directly hit nine times during the war. The Private Chapel was destroyed during the bombing and an on-duty policeman, PC Steve Robertson, was killed by falling debris. Despite this, the royal family was determined to remain in London and did so until the end of the war. Some of the most iconic images of the royal family have come from the Buckingham Palace Balcony. Since Queen Victoria in 1851, the balcony has been a place for the Royals to greet the public. At the end of the second world war on VE day, King George VI and the royal family was joined by Winston Churchill to celebrate. The crowds were jubilant, and the royal family made eight appearances on the balcony that day. Every year the royal family appears on the balcony for the Trooping the Colour in celebration of the monarch’s birthday. Additionally, the balcony has been used to present newly married royals, such as Prince Charles and Diana; Prince Edward and Sarah Ferguson and most recently Prince William and Kate Middleton in 2011. Prince William and Kate delighted the crowds by obliging them with two kisses. Buckingham Palace has its own company of Girl Guides. The 1st Buckingham Palace Company of girl guides was formed in 1937 when the then Princess Elizabeth enrolled as a Girl Guide. The girls reportedly camped, cooked and earnt several badges in the palace gardens. In 1883 the Palace gained electricity. The house currently uses over 40,000 lightbulbs. If there is ever a royal birth or death, a notice is attached to the railings of Buckingham Palace to alert members of the public. Every Palace Employee (around 1500 people) receives a Christmas pudding every year, a tradition started by George V and is continued today. If the sovereign is present the Royal Standard is flown. If the Union Flag is flying it means that the Queen is not in residence.